We motored down Sterling Highway to Deep Creek Recreation Area on Friday. It was a short drive of about an hour on the way towards Homer. We got two excellent sites together overlooking the water. We lazed about for 2 days instead of going into Homer again. We enjoyed two camp fires on the beach at midnight. Just us around the fire enjoying good company, hot chocolate and Mt Redoubt across Cook Inlet. 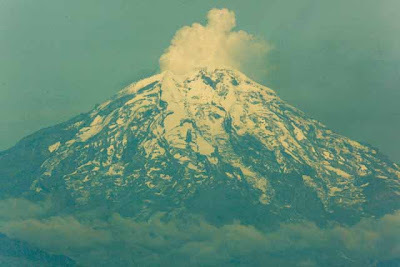 Mount Redoubt is an active volcano and has been venting for most of the summer. You can see steam in the photo. The girls kept themselves busy beachcombing and exploring the area. We all went in search of the elusive bald eagles. The campground host told us that a month ago there must have been 50 or more eagles around Deep Creek feasting on fish heading up stream. We spotted one or two eagles the first day in Deep Creek but as soon as I got my tripod and lens setup, off they went! Things went a little better on Saturday. Jane spotted an eagle sitting in the trees below the cliffs at the mouth of Deep Creek but he was just too far away, even with my 500mm lens. He was just below the light house in the top photo. 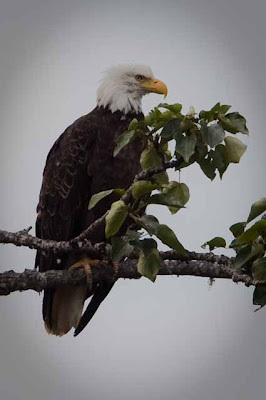 Chris and I went for a little drive up to the main highway where the two Deep Creek pull outs are and it was there that she spotted an eagle sitting in a tree overlooking a bunch of salmon fishermen on the river. We both took a bunch of photos. 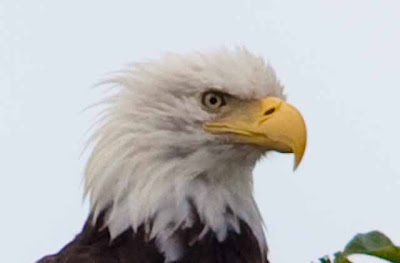 Lighting was the pits but at least we got to see an eagle from fairly close range. One bit of bad news with our phaeton. I discovered what appears to be a small oil leak on or , at least, around the hub of the right wheel on our tag axle. I called Spartan and they had me pull the hub cap, tighten the nuts around the oil well and clean up the oil. Looks like there is still a small leak though. Spartan has given the name of several service centres in Whitehorse, so we will be stopping there to get it repaired under warranty. We were in the process of barbequing supper on Saturday when two surprise visitors from Ottawa popped by our site. 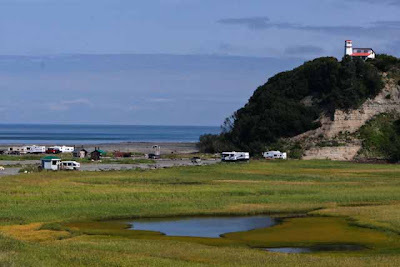 Jag and Bev are fellow phaeton owners also touring Alaska. It really is a small world when you can cross paths while RVing on the other side of the continent. Sunday we head for points east along the Glenn Highway. Not sure where we will overnight yet. Monday we arrive in Valdez for 2 days. Maybe do some fishing if we have time too. This entry was posted in Alaska, Photography, Wildlife.